In the past few years, I’ve seen researches showing that Cyber Monday might not be the best day for online merchants in the year anymore, but latest data totally disagrees with that statement. The biggest jump in sales compared to the 2011 was on the Thanksgiving day, as sales rose 32% from 479 million dollars to 633 million. The first day to break the billion dollar barrier in 2012 was the Black Friday with growth of astonishing 28% and sales of 1,042 million dollars compared to last years sub-billion sales of 816 million dollars. Cyber Monday 2012 experienced 17% growth compared to the 2011, generating 1,465 million dollars spend compared to last year’s 1,251 million dollars. 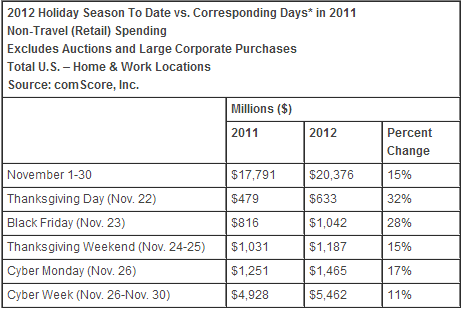 The Cyber Week (this year was Nov 26 – Nov 30) generated whooping 5,462 million dollars in online spending. There were 3 days with sales over 1 billion in this Cyber Week. Does this mean we (as an eCommerce industry) should shift focus on promotional activities for the Cyber Week, rather than Cyber Monday? Should the extended deals that last the whole week become a standard? I do not know, but what is clear is that this year’s holiday sales season was amazing for online merchants, the industry growth was as high as anyone could expect. 2012 is a great year to be online merchants and I’m sure 2013 will be even better!